i made my first* subframe thing using the column design pattern! *i actually used the column design pattern in my sierpinski generator but that was simple and i didnt compact every column to be 1 pixel tall. player4444: quantum randomness doesn't affect a computer's normal output. Cant you link everything to quantum? 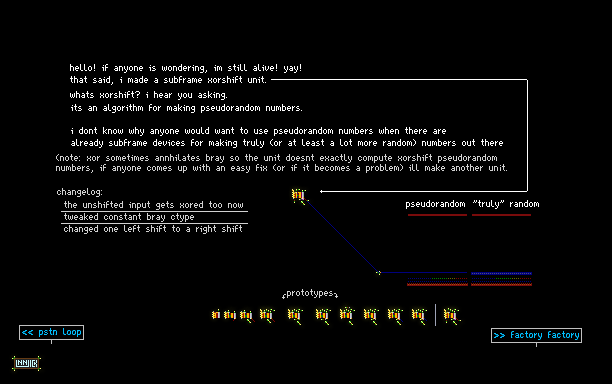 @kazitor Nothing that counts on deterministic calculations can produce a truly random number. People call atmospheric noise random howver, because qunatum shet happens, which is truly random (or so we think so far). I've said that electronics are going to become less relevant to users in TPT and it has. Electronic saves would get more notice than they do now. I wouldn't say anything in TPT generates truly random numbers; it's just using TPT's pseduorandom generator at the end of the day. It is fp-dying. So that proves that a creation is nothing if you dont have anything flashy to show.